The Afghan conflict has refocused world attention on Waziristan. Once one of the British Empire's most volatile territories, the remote small province in northwestern Pakistan is now home to Taliban insurgents, al-Qaeda fighters, rogue elements within the Pakistani military, and Western jihadists, who use it as a base to rest, heal, rearm, train, and plan before they launch again across the porous border into Afghanistan. It is also the area where Osama bin Laden and many of his top lieutenants are probably hiding and a regular target for U.S. air strikes against key Taliban personnel. Pakistani military operations destroyed insurgent forces and caused mass civilian dislocation, yet efforts to produce a lasting peace deal with the local tribesmen and the Taliban have proved futile. Waziristan remains a dangerous and unpredictable region with the potential to unhinge President Hamid Karzai's fragile regime in Afghanistan, threaten the Pakistani government, and pose a major challenge to regional stability. Photo courtesy of the Green Howards Museum, Richmond, N. Yorkshire, England. 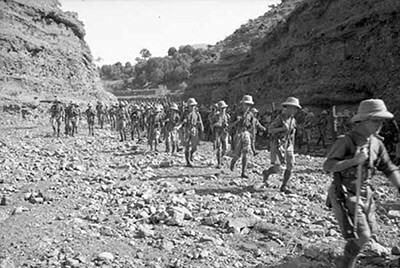 A British battalion patrols in Waziristan, 1938. Military operations were finite in duration and localized in their employment. Against a fiercely independent and fanatical foe, any enduring occupation of tribal territory by foreigners was hotly contested. The pertinent lessons from Britain's experience in the region can help policymakers understand and address present-day challenges in the same geographical area, not least since the British faced the same issues and had several of the same internal arguments. To be sure, there are significant differences separating the British experience in Waziristan from that which now confronts the North Atlantic Treaty Organization (NATO), which in turn set restrictions to what can be derived from the past. As Captain John Girling, a south Waziristan scout veteran, recalled in 2009: "Up to ten years ago there were [contemporary] similarities, but since the coming of the Taliban, I can't see any similarities." However, despite the passage of time and the change in technological and geopolitical circumstances, some of the parallels between the British experience of Waziristan and NATO's remain pertinent and provide valuable insights to today's political and military strategists. During the nineteenth and early twentieth century, the British colonial administration was responsible for the complex task of maintaining law and order in Waziristan. After decades of unwanted and costly experimentation, the British decided that hands-off "containment" was the best policy. Control, as in the Indian states, was neither necessary, desirable, nor practicable. With limited resources, control was exercised by the distribution of allowances to sympathetic maliks (tribal representatives or elders) and by the employment of locally recruited kassadar (tribal policemen) and indigenous forces, known as scouts or the Irregular Frontier Corps. Each proved invaluable in maintaining order and relieving regular troops of the expensive work of garrisoning frontier outposts. In the event of any situation escalating out of control, the army of India was the fallback force on the frontier. This multilayered structure brought effective governance to the fractious inhabitants via a sliding scale of violence: first enticements, rewards, and threats; next tribal kassadars, then the lightly-armed scouts; only in extremis, when outbreaks were too excessive to be controlled by the scouts, would the political authorities call on the army to conduct a punitive expedition in order to administer punishment. Working with the forces in society and grounding policy in regional realities offered the only hope of controlling the unpredictable and confrontational tribesmen. Despite this deft approach, based on organizations that were relatively optimal to the demands of the region and sympathetic to local conditions, the constant threat of tribal unrest remained. In 1936, a compelling leader and frontier personality, known as the Fakir of Ipi, began a political career that tested the British administrative and military apparatus from the time he instigated a rebellion in Waziristan until Britain's departure in 1947. Even though he possessed no formal military training, the fakir provided a charismatic figurehead to the rebellion and maintained his position through dogged determination, strength of personality, and an elevated religious position. As a rebel leader he was uncompromising and his hatred of the British celebrated. Such was his belief in local Muslim grievances and desire for an independent Pashtunistan that he possessed the nerve and courage to face considerable danger and privation. The more the fakir eluded government forces and guided the insurrection, the more his divine status was confirmed. Despite the employment of more than 40,000 British and Indian troops to locate his whereabouts in Waziristan, the fakir continued to evade capture and frustrate his pursuers. He died of natural causes in 1960, having never faced a magistrate's bench. Despite injecting large numbers of military reinforcements into tribal territory in 1936-37 in pursuit of the fakir, the British never sought full control in the latter years of the colonial period. Military operations were finite in duration and localized in their employment. Against a fiercely independent and fanatical foe, any enduring occupation of tribal territory by foreigners was hotly contested. Political primacy remained paramount, and routine control occurred via the locally recruited scouts and kassadars. This approach was based on a light touch, commitment, and continuity but was underpinned by an early and firm response if the tribes stepped out of line. As a rule, the rights and customs of the tribesmen were respected; nothing was ever done to interfere with their religious beliefs and customs. Only a deep-seated knowledge of the region, gained through regular contact and an enduring desire to learn, helped point to the conditions necessary to help maintain tribal control. There are many aspects of Waziristan that remain the same. Predictably, the topography has altered little since the British departed in 1947, and the mountainous terrain still influences tribal culture and linkages. Likewise, the region is still inhabited by a complex mixture of independent tribes that have changed little over the years. For the majority of tribesmen, life is still tedious, and opportunities for excitement and travel are rare. Moreover, the inaccessible terrain continues to make the region an impregnable base in which to hide, train, and launch attacks. Insurgent and fugitive forces have little difficulty in finding long-term sanctuary in the region; it is almost impossible to distinguish militants from peaceful tribesmen. Equally, the terrain helps to mitigate technological advances and frustrates regular forces. Accurate or timely intelligence is rarely available. The climate remains extreme, and the region still suffers from elevated levels of poverty and underdevelopment. Unemployment, illiteracy, and infant mortality remain high. Access to medical facilities in many remote regions is almost nonexistent. It remains an area in desperate need of social and economic development. Likewise, the tribes remain particularly susceptible to blood feuds and religious extremists. As with their ancestors, the tribesmen continue to resist outside influence or control, regardless of its legitimacy, and regard any foreign presence as a personal affront to their independence. The Hindu and the Westerner are equally foreign to the tribesmen. Pashtunwali—the tribal code of honor—still usurps Islamic Shari'a (Islamic law), and internal politics still govern tribal behavior. These similarities notwithstanding, there are a number of notable differences that have occurred over recent years. Perhaps the most disturbing is the number of maliks who have been intimidated or killed by the local Taliban. In a sustained process of creeping "Talibanization" across Waziristan, the militants have employed a reign of terror against tribal maliks and alleged government sympathizers. Such targeted violence has generated new tensions that have further added to the region's volatility and unpredictability. This is not without precedent. As one tribesman warned the British commander in the province, Mountstuart Elphinstone, in 1809: "We are content with discord; we are content with alarms; we are content with blood ... we will never be content with a master." Nonetheless, many local leaders have been replaced by radicalized Taliban substitutes. Several have established tacit control over large areas, imposing a strict interpretation of Islam. Such leaders provide a recognized chain of command and a clear hierarchy. They also provide basic, if limited, training and engender tribal discipline. However, in overriding the traditional tribal hierarchy, the Taliban have unconsciously damaged long-established Pashtun civil society and reinforced ethnic suspicion. Fortunately, the damage is repairable and the foundations of society remain strong. It is not surprising, therefore, that Christian Tripodi, a lecturer at the U.K. Joint Services Command and Staff College, cautions that the difficulties experienced by Pakistan's political and military initiatives to control the federally administrated tribal areas indicate that the tribes are just as complex to handle today as they ever were in colonial times "even for those sharing the same religious and cultural affiliation." For nearly a decade, the British army chased him [the Fakir of Ipi] and his followers through the remote reaches of Waziristan and the North-West Frontier Province—the same ground where allied troops have spent the past five years searching fruitlessly for bin Laden, and where the remnants of Afghanistan's Taliban fled to lick their wounds and recover their strength. The region was then, as it is today, a powder keg of fractious tribes and fundamentalist firebrands, and Britain's experience with trying to capture Khan mirrors the frustrating hunt for bin Laden. Despite well-developed political and military machinery, the British government consistently failed to kill or capture the fakir or fully negate his influence. Bombing raids by the Royal Air Force and several division-strength operations proved futile. The fakir's superior local intelligence, mobility, and ability to blend in with the indigenous tribesmen routinely thwarted British efforts despite the most troop-intensive British counter-insurgency of the twentieth century. Similarly, coalition forces, despite employing advanced technology, have failed to kill or capture bin Laden or eradicate al-Qaeda from the Pashtun tribal areas astride the border. Yet far from being frustrated by this similarity, coalition forces can draw some comfort from one aspect of this important parallel. Both leaders experienced a high point in their popularity followed by a gradual decrease in their influence. In the case of the fakir, he lost most of his influence with India's independence and became little more than an irritant to the Pakistani government. Likewise, bin Laden's authority has diminished considerably in recent years. No longer the real impetus behind al-Qaeda, he remains the notional or spiritual head but has largely been eclipsed by his deputy, Ayman al-Zawahiri, who has emerged as the organization's strategist and driving force, supported by a network of independent and autonomous leaders. At the same time, this hydra-like insurgency, based on a highly decentralized and geographically localized approach, also highlights the difficulties of countering a distributed insurgency under local control. Delegating responsibility to a changing structure of loyal lieutenants, who have a profound interest in the continuation of hostile activities because their stature and raison d'être often depend on their militant activity, is particularly difficult to counter. They can exhaust and overstretch occupation forces and frustrate the penetration of the state. Decapitating any of the current leadership will therefore do little more than buy time. As recent history proves, there are always plenty of ambitious individuals in the wings ready to take on the challenge of leadership. Tackling the cause of the violence and not the symptoms is the key to lasting success. First, the question must be asked as to whether or not the villagers saw the soldiers as legitimate guests, or as unwanted visitors? ... If guests, then the provision of pashtunwali should have applied and our [the Canadian army's] resultant actions can be seen as appropriate. If the soldiers and their leaders were not invited, then there is certainly scope to view the attack as justifiable in the mind of the attacker and his fellow insurgents. Second, in using the principles and practices of pashtunwali to bring discredit to the village involved, one has to ask whether or not our actions reinforced the legitimate government of Afghanistan or eroded its authority in that particular district? Certainly there was nothing wrong with a response to the attack that would be understood by local villagers, as well as demonstrating that we understood elements of their cultural makeup. However, in reinforcing the legitimacy of the jirga [assembly or parliament of tribal representatives] and the code itself, we were not reinforcing the short-term perspective with regard to the authority of President Karzai in that one particular region of Kandahar province. As the British experienced in the colonial period, cultural acuity must extend beyond those engaged in everyday contact with the tribesmen. Since policy is often determined by those in distant capitals, politicians and senior military commanders must also understand regional culture, customs, ethnicity, and religion. This is equally true of nongovernmental organizations, such as private military companies and aid organizations. Failure to understand these complex dynamics can have a damaging effect on campaign consent. Likewise, policymakers must be tolerant of indigenous assumptions, methods of behavior, and everyday life choices. These will undoubtedly pose moral dilemmas for foreign and regional governments. Western values, free markets, and standards of government are often alien to indigenous populations. Expecting either a strong centrist or Western-style administration to take hold in a conservative tribal region with no recent history of strong central government is unreasonable. Cultural understanding between governmental and nongovernmental organizations is just as important and will help to reduce friction. It will also assist in building effective working relationships and negate procedural barriers. Linked to cultural understanding is the ability to communicate. As one commentator on the frontier noted, "The gain in personal influence, besides other advantages, which an ability to converse directly with the people gives an Englishman among Pathans is so obvious that I need not dilate on it." The same is equally true today. However, due to the difficulty of learning Pashtu, few Western politicians or military commanders possess the ability to converse with the tribesmen without the use of an interpreter. Cultural acuity remains an important but insufficiently resourced goal. Regular rotations of military commanders and political reshuffles continue to thwart an in-depth understanding of cultural norms and standards on the frontier. Not surprisingly, this has resulted in some Western policymakers disregarding or downplaying the primacy of cultural values in their efforts to shape policy along the Afghan-Pakistani border. In contrast, the Taliban and al-Qaeda cleverly exploit them for "recruitment, shelter, and social mobilization." The key to success is translating cultural understanding into effective frontier policy, enabling NATO better to achieve its goals. However, to do this effectively requires a lifetime of specialized study and long periods of unbroken service. Creating an organization similar to the Civil Service of Pakistan in southern Afghanistan may be one initiative to help address the deficiency of cultural awareness and regional knowledge along the border. The Afghan-Pakistani border, the Durand Line, is 1,640 miles long. It follows arbitrary geographical features and represents the historical limits of British authority in 1893. With little consideration for tribal or ethnic boundaries, the border divided the Pathan tribes between Afghanistan and Pakistan. Since its establishment, the artificial border has been viewed with disdain and is largely ignored by politicians and tribesmen on both sides of the divide. In practical terms, the border is not enforced and, arguably, not enforceable. In countless places, the line of demarcation remains contested. In others, it dissects villages and even individual homes between two opposing governments. Tribesmen from both sides of the border continue to cross freely, often using hidden mountain tracks. A significant number of tribesmen have family ties on both sides. The Soviets, like the British, tried to exert greater control along the border in the 1980s, but their efforts proved futile. Due to growing frustrations, they resorted to draconian measures, including mining trade routes throughout the area. This failed to bring an end to cross-border movement and the supply of vital aid. After the Soviet withdrawal, the security of the border was largely ignored, and both sides only saw fit to hold key entry and exit points. However, as a result of growing coalition pressure, this policy has changed. Increasing efforts are now being made to secure the border through a combination of manned crossing points, improved surveillance, and focused patrolling. Pakistani projects are also underway to "fence off" sections of the border and to restrict movement in and out of Pakistan, primarily through the use of antipersonnel mines. In the long term, this initiative aims to contain the Taliban and al-Qaeda in Afghanistan although in the short to medium term, it is expected to fuel more fighting on Pakistani soil. Restricted access and antipersonnel mines will only go so far. Atlantic Monthly correspondent and author Robert Kaplan points to one reason why: "Only Pathans could make walking through a minefield a test of manhood." To overcome such realities, both governments should formally recognize the international border and place historical bitterness and mistrust behind them. They will also have to view the border as a joint problem, requiring joint solutions. Likewise, both armies must patrol their side of the border effectively and work together to monitor militant activity and provide early warning of cross-border movement. They should also combine the use of information operations to influence the local tribesmen. Indigenous forces, like the paramilitary Frontier Corps, are best placed to undertake the difficult task of controlling the frontier. Should regular forces be required, these must consist of Pashtun units—mixed battalions, as the British experienced, will have little success. Outsiders will not be tolerated in tribal territory. This will prove particularly challenging for the Pakistanis. Ethnic Punjabis dominate the army, and their presence in tribal territory will be a constant affront to the tribesmen. Moreover, efforts to control the border must not challenge the autonomy and freedom of the tribesmen. Communication, economic development, and cultural ties must not be severed. Achieving an effective balance will be difficult. In 1975, Wali Khan, the National Awami Party leader, was asked if he was "a Muslim, a Pakistani, or a Pashtun first?" His reply highlighted the complexity of the border problem. Khan responded by saying that he was "a six-thousand-year-old Pashtun, a thousand-year-old Muslim and a twenty-seven year old Pakistani." The coalition presence in Afghanistan continues to provide a visible target and rallying point for the extremists. As the British experience proved, the presence of Western forces in tribal territory is a constant affront to the tribesmen and provides a welcome opportunity to test their manhood and courage against a recognized foe. To overcome this, the coalition should give thought to reducing its footprint in the provinces along the Afghan-Pakistani border and make better use of locally recruited forces, for example, the nascent Afghan border police. Despite ethnic tensions and desertions, the Afghan National Army has the skill and weaponry to maintain stability along its side of the border. However, it lacks specialist technology, so intelligence, surveillance, reconnaissance, and communication assistance will be required in the short term. It should also conduct operations on terms that the tribesmen accept and understand. This will undoubtedly require compromise. The same shortfalls are equally true of the Pakistani army, which, in addition, can also rely on the highly skilled militias of the Frontier Corps. Should Western coalition forces be required in tribal territory on the Afghan side of the border, they should only deploy for a finite period of time against a recognized target. Only in extremis should coalition forces cross the border into Pakistan. Advanced technology and long-range weapons should be used where possible to negate the need for inserting troops on the ground. The past provides a useful blueprint for adaptation, and Waziristan provides good proof of this. Certain combined measures worked to settle, suppress, and pacify the region during the colonial period. For example, the establishment of a robust network of roads, medical missions, the payment of allowances, and the employment of political officers, indigenous scouts, and tribal police all helped to control the region within recognized limitations. Predictably, this was not lost on the Pakistanis, and the established methods of British tribal control remained largely in place until late 2001. Growing U.S. political pressure resulted in President Musharraf resorting to greater military action, including the use of helicopter gunships and artillery, to quash the upsurge of violence emanating from tribal territory. Unfortunately, the Pakistani army was an organization structured and trained for a conventional fight against India, Pakistan's arch-rival, and ill-prepared for guerrilla warfare on the frontier. The army's ham-fisted approach to the unique problems of the frontier irritated and alienated the indigenous tribesmen. The ensuing breakdown in relations was entirely predictable. Our modern scruples might not permit it, but I think you could buy off 90 percent of the opposition tomorrow in the way our grandfathers would have done. Instead, today we seek influence through reconstruction and development—but that is in danger of not keeping pace with people's expectations. Nor does such an approach chime with the feudal nature of a society … Our colonial forebears understood the way feudal societies worked; for the most part, we don't. we always worked very hard on achieving and maintaining consent: Countless hours were spent talking to tribal elders and other influential people. We had to justify ourselves to them, explain what we were trying to achieve, and work to retain their support. That is an abiding lesson from our own historical experience, which we relearned and applied pretty aggressively. However, at the psychological level, the notion of a colonial model of control will be unacceptable to the tribesmen unless re-branded within a recognized, ethnic framework. This is best achieved by electing empowered, provincial governors and providing them with clear jurisdiction. Selected individuals could be tasked with overseeing regional security and reconstruction. However, proficiency will be based on education, experience, and personality; selecting the right individual will be the key. Moreover, in addition to decentralized control, multiple lines of economic and social development will be central to controlling the region in the long term. These need to be approved by tribal leaders and have the consent of the tribesmen and their families. They must also reflect population densities. For example, the lines of development in sparsely populated rural areas must be different from those in the densely populated urban areas. One size will not fit all. Pan-regional initiatives should focus on strengthening traditional tribal structures and on bringing rapid improvements to the lives of the tribesmen. Health programs and food aid are also essential and would go some way to addressing allegations of regional discrimination. Even a small amount of the US$80 million a month "coalition support fund," paid to reimburse Pakistan's military for the cost of their counterinsurgency operations, would help to redress the perceived imbalance. But the reality is that social and economic development will take a long time, and patience is essential. Moreover, aid must be administered by the tribesmen themselves, no matter how haphazardly they do it. Outsiders operating in tribal territory would polarize the tribesmen and further add to the volatility of the region. The disturbing growth of al-Qaeda and the Taliban in the isolated Pashtun tribal belt astride the Afghan-Pakistani border is a major cause for concern. A growing alignment of the Pasthun nationalist movement and radical, militant leadership could lead to the unification of approximately forty million tribesmen on both sides of the Durand Line. In theory, this could result in the breakup of Afghanistan and Pakistan, both fragile multiethnic states, and allow the emergence of a new radicalized state: Pakhtunistan. Fortunately, two prominent fault lines exist in this hypothesis. First, many of the tribesmen dislike the extremists and would not throw in their lot with religious fanatics and suicide bombers. The growing friction between the Taliban and the tribal leadership (both malik and mullah) is evidence of this growing rift. Second, the notion of a unified Pashtunistan has always been predominantly symbolic. Trying to unite the fiercely independent and autonomous tribes into a cohesive whole would be difficult. This could only occur under extreme duress or under the inspiration of a charismatic leader. However, the signs are increasingly apparent that this might be possible. As the Pakistani ambassador, Mahmud Ali Durrani, cautioned in March 2007, "I hope the Taliban and Pashtun nationalism don't merge. If that happens, we've had it, and we're on the verge of that." Unlike the challenges faced by the British in the first half of the twentieth century, this is no longer simply a regional dilemma. Instead, the tribal complexities demand an international approach, based on shared security objectives. Political efforts must be made to succeed in driving an irreparable wedge between the moderate or reconcilable Taliban and extremist and irreconcilable Taliban associated with al-Qaeda. Provincial autonomy should also be considered. It worked well for the British and could help reinforce the long-term survival of Pakistan in its current form. Likewise, both governments must address the long-standing conflicts over the frontier region. In short, the border tribesmen must be a key part of the solution and not just the target audience. If the past is prologue, the British experience of Waziristan points to a difficult and frustrating road ahead. A violence-truce-violence cycle can be expected along the border with cease-fires both fragile and short-lived. For the most part, government forces will not encounter direct military confrontation. Organized resistance will consist of sniping, ambushing, and the use of mines, homemade explosive devices, roadside bombs, and suicide bombers. Insurgents will not employ the rules of conventional warfare, and tactical errors will never go unpunished. Militant tribesmen will display remarkable levels of ingenuity, physical endurance, and tenacity; opportunities for decisive effect will be fleeting and unconventional. Initiative will be required at all levels. Government reprisals will struggle to achieve surprise, and tribesmen will regularly withdraw to isolated caves or remote valleys to seek sanctuary where it will be problematic to distinguish between friend and foe. The danger is that military operations will run at a tempo and a momentum that misleads commanders into thinking that they are succeeding. Only a holistic, joint, and measured approach, employing all the elements of national power, will offer the greatest opportunity for pacifying the region and gaining consent. This must be consistent, sensitive, agile, and coherent. In the short term, perhaps the best that can be achieved is containment; a safe, democratic, and prosperous area may be too much for which to hope. Political objectives must be realistic and born of pragmatism. However, failure to address the long-term challenges of the region with a firm and consistent policy could be disastrous for both Afghanistan and Pakistan. The stakes are high, and it would be wise to heed Lord Curzon, a former viceroy: "No man who has ever read the pages of Indian history will ever prophesy about the frontier." When governments are short of ideas, and the "Talibanization" of the frontier is gaining momentum, the historical British approach to Waziristan offers a number of valuable insights and practical measures worthy of consideration. Andrew M. Roe, a British infantry officer, who recently served as an Afghan kandak commander mentor for six months, is the author of Waging War in Waziristan (University Press of Kansas, 2010) from which this article is adapted. Frank Ellis, "Arts and Books," The Salisbury Review, Sept. 2010. W. I. Moberly, Raj and Post-Raj (Edinburgh: Pentland Press, 1985), p. 69. Alan Warren, Waziristan, the Faqir of Ipi, and the Indian Army (Oxford: Oxford University Press, 2000). Hugh R.C. Pettigrew, Frontier Scouts (Selsey: privately printed, 1964), p. 100. Barnett R. Rubin and Abubakar Siddique, "Resolving the Pakistan-Afghanistan Stalemate," Special Report 176 (Washington, D.C.: United States Institute of Peace, Oct. 2006), p. 13. Stephen Tanner, Afghanistan: A Military History from Alexander the Great to the Fall of the Taliban (New York: Da Capo, 2002), p. 134. Christian Tripodi, "Cultural Understanding: Its Utility and Influence: The British Experience on the North-West Frontier, 1918-1939," British Army Review, Spring 2008, p. 26. T. Harding, "How the British Empire Failed to Tame the Terrorist Fakir of Ipi," The Daily Telegraph (London), Nov. 15, 2001; Newsweek, May 30, 2005. Pervez Musharraf, In the Line of Fire (New York: The Free Press, 2006), p. 220. "Profile: Ayman al-Zawahiri," BBC News, Sept. 27, 2004. Richard Tod Strickland, "The Way of the Pashtun: Pashtunwali," Canadian Army Journal, Fall 2007, p. 44. Montgomery McFate, "Does Culture Matter? The Military Utility of Understanding Adversary Culture," Joint Forces Quarterly, 38 (2005): 42-8. Septimus S. Thorburn, Bannu, Our Afghan Frontier (Whitefish, Mont. : Kessinger Publishing, 2004), p. 166. Thomas H. Johnson and M. Chris Mason, "No Sign until the Burst of Fire," International Security, Spring 2008, p. 64. Sean M. Maloney, Enduring the Freedom (Washington, D.C.: Potomac Books, 2005), p. 294. Usman Ansari, "Cobras over the Frontier," Air Forces Monthly, Apr. 2008, p. 66. Robert D. Kaplan, Soldiers of God: With Islamic Warriors in Afghanistan and Pakistan (New York: Vintage Books, 2001), p. 22. Robert F. Baumann, "Russian-Soviet Unconventional Wars in the Caucasus, Central Asia, and Afghanistan," Leavenworth Papers, no. 20, Combat Studies Institute, U.S. Army Command and General Staff College, Leavenworth, Kans., 1993, p. 167. Selig S. Harrison, "Pashtunistan: The Challenge to Pakistan and Afghanistan," Real Instituto Elcano, Madrid, Apr. 2, 2008, p. 3. Musharraf, In the Line of Fire, p. 271. Ibid., pp. 201-4; Maloney, Enduring the Freedom, p. 294. Richard Cobbold, "RUSI Interview with General David Richards," Journal of the Royal Artillery, Autumn 2007, p. 57. Rory Stewart and Sherard Cowper-Coles, "Are We Failing in Afghanistan?" British Army Review, Spring 2008, p. 10. The U.S. provided approximately $10.5 billion in aid to Pakistan from 2002-07. Just over $5.5 billion was earmarked by Islamabad for the tribal territory, but only 4 percent was used on nonmilitary projects. New World Encyclopedia, Nov. 27, 2008, s.v. Pashtun people. Abdulkader H. Sinno, Organizations at War in Afghanistan and Beyond (New York: Cornell University Press, 2008), pp. 237-45. Harrison, "Pashtunistan: The Challenge to Pakistan and Afghanistan," p. 5. George N. Curzon, Speeches as Viceroy and Governor-General of India, 1898-1905 (London: Macmillan, 1906), p. 43. Related Topics: Central Asia, South Asia | Winter 2011 MEQ receive the latest by email: subscribe to the free mef mailing list This text may be reposted or forwarded so long as it is presented as an integral whole with complete and accurate information provided about its author, date, place of publication, and original URL.